Young women are learning to program computers in the unlikeliest of places, developing apps that will help their neighbors—and themselves. If not for a view of the ornate Uganda National Mosque or the sprawling, congested taxi park in the distance, it would be hard to tell that Outbox, a technology incubator and accelerator, is in a high-rise in Kampala (Uganda’s capital city) and not some non-descript office building in Silicon Valley. The vibe is intense and laid-back all at once. Modern, cushy chairs and long conference tables are used by casually-dressed young people typing furiously on MacBooks in a quest to create the next big thing. Formidable, expansive blinds in cascading green, blue, red and yellow cover its floor-to-ceiling windows (evoking Google, an organization that partially funds the space through its Google for Entrepreneurs initiative). At one of the long tables, a group watched quietly as Joldeen Mirembe, a tack-sharp 23-year old woman, presented her latest creation: a website. While everyone was notably relaxed, each had something to say, asking questions or merely pointing something out. A few offered constructive criticism, which Joldeen accepted with the zeal of someone hungry to learn. A year ago, Joldeen didn’t know how to design a website or program an app. She had always wanted to learn how, but felt uncomfortable in the male-dominated computer science courses offered at her university. “Sometimes [when] you’re doing programs with boys, you find that girls are a little shy to come up if they don’t understand,” she explained to me after her presentation. 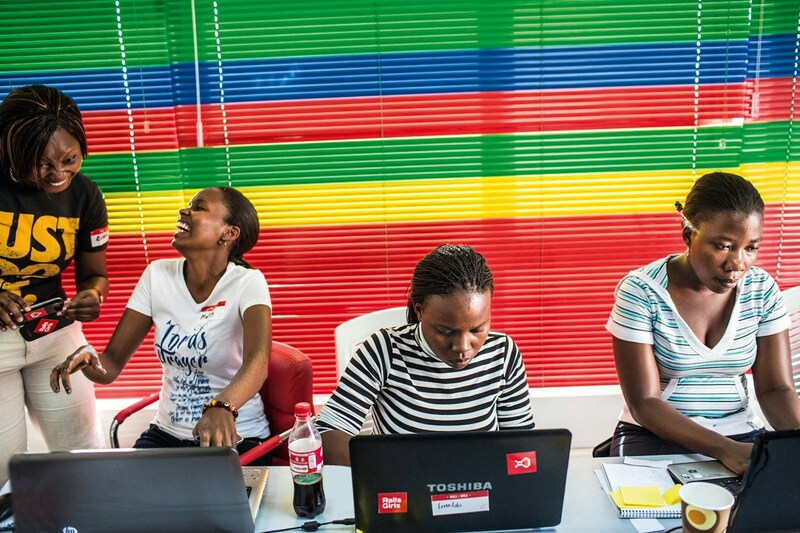 Read More Geeking Out: Uganda’s Women are Creating the Next Generation of Girl Geeks – The Daily Beast. This entry was posted in News from the Soul Brother and tagged Africa, computers, engineering, GirlGeekKampala, mathematics, science, technology, Uganda, women. Bookmark the permalink.